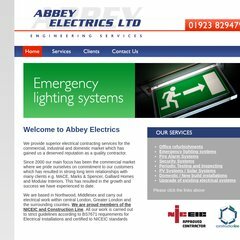 Topics: Emergency Lighting Systems, Fire Alarm Systems, Security Systems, Periodic Testing And Inspecting, Pv Systems / Solar Systems, and Domestic / New Build Installations. It has 2 DNS records, ns1.ukfast.net, and ns0.ukfast.net. It is hosted by Ukfastnet Ltd (England, Manchester,) using Microsoft-IIS/7 web server. ASP.NET is its coding language environment.